1. Introduction. 2. Yellowstone geod anomaly. 3. Regional Heat Flux. 4. Today Activity. 5. Hot Spot. 6. Seismic Activity. 7. Internal Structure. Seismic Tomography Imaging. The Yellowstone Caldera is the largest volcanic system in North America. It has been termed a "supervolcano" because the caldera was formed by exceptionally large explosive eruptions. The current caldera was created by a cataclysmic eruption that occurred 640,000 years ago, which released 1,000 km3 of ash, rock and pyroclastic materials. It produced a crater nearly of a one km deep and 84 by 45 km in area and deposited the Lava Creek Tuff, a welded tuff geologic formation. The most violent known eruption, which occurred 2.1 million years ago, ejected 2,450 km3 of volcanic material and created the rock formation known as the Huckleberry Ridge Tuff and created the Island Park Caldera. A smaller eruption ejected 280 km3 of material 1.2 million years ago, depositing the Mesa Falls Tuff and forming the Henry's Fork Caldera. A subsequent minor climax eruption occurred 160,000 years ago. It formed the relatively small caldera that contains the West Thumb of Yellowstone Lake. Later, two smaller eruptive cycles, the last one ending about 70,000 years ago, buried much of the caldera under thick lava flows. Each eruption is in fact a part of an eruptive cycle that climaxes with the collapse of the roof of a partially emptied magma chamber. This creates a crater, called a caldera, and releases vast amounts of volcanic material, usually through fissures that ring the caldera. The time between the last three cataclysmic eruptions in the Yellowstone area has ranged from 600,000 to 900,000 years. Fig. 2. Yellowstone sits on top of three overlapping calderas. 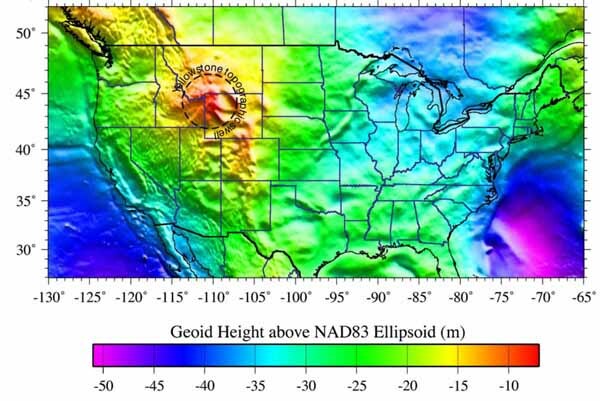 North America geoid map showing the Yellowstone has a ~ 500-km-wide topographic swell. Fig. 3. Gravity signatures of Yellowstone global hotspots. The averaged regional heat flux of the Snake River Plain is ~150 mWm-2, about 30% higher than the Basin-Range to the south and three times higher than the background flux of the Rocky Mountains to the east. But the extraordinarily high heat flow of ~2,000 mWm-2 of the Yellowstone Plateau is more than 30-40 times the average heat flow of continents. About 25% of the total flux is thought to be due to conductive heat transfer from crustal magma sources that in turn is fed by magmas from the Yellowstone mantle plume. Throughout Yellowstone, heat flow is variable because it is highly affected by shallow convective hydrothermal fluid flow and shallow magma migration. Fig. 4. (a) Heatflow of the Yellowstone and the Snake River Plain, with heatflow of the ESRP averaging ~150 mWm-2; (b) The scale show heat flow of ~200 mWm-2; and (c) very high heatflow of Yellowstone Lake ranges from ~100 mWm-2 to extraordinarily high 30,000 mWm-2. Geologists are closely monitoring the rise and fall of the Yellowstone Plateau, which measures on average 1.5 cm yearly, as an indication of changes in magma chamber pressure.The upward movement of the Yellowstone caldera floor—almost 7.6 cm each year between 2004 and 2008 was more than three times greater than ever observed since such measurements began in 1923. From mid-Summer 2004 through mid-Summer 2008, the land surface within the caldera moved upwards, as much as 20 cm at the White Lake GPS station. Fig. 5. Diagram of the Yellowstone Caldera. By the end of 2009, the uplift had slowed significantly and appeared to have stopped. In January 2010, the USGS stated "that uplift of the Yellowstone Caldera has slowed significantly" and uplift continues but at a slower pace. Fig. 6. 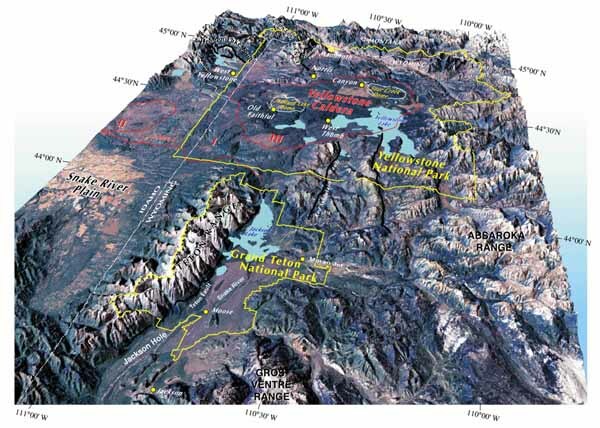 Crustal deformation of the Yellowstone Plateau from precise leveling and GPS observations. Color backgrounds represent vertical motion (mm) measured from (a) leveling surveys between 1923 and 1987 (mm) and (b)-(d) GPS campaigns between 1987 and 2003. Red circles represent campaign GPS sites, yellow circles represent permanent GPS stations, and arrows are the direction of motion relative to stable North America. Time windows correspond to the distinct periods of caldera uplift and subsidence. Yellowstone is at the northeastern end of the Snake River Plain, a great U-shaped arc through the mountains that extends from Boise, Idaho some 640 km to the west. This feature traces the route of the North American Plate over the last 17 million years as it was transported by plate tectonics across a stationary mantle hotspot. The landscape of present-day Yellowstone National Park is the most recent manifestation of this hotspot below the crust of the Earth. The source of the Yellowstone hotspot is controversial. Some geoscientists hypothesize that the Yellowstone hotspot is the effect of an interaction between local conditions in the lithosphere and upper mantle convection. Others prefer a deep mantle origin (mantle plume). Part of the controversy is due to the relatively sudden appearance of the hotspot in the geologic record. Additionally, the Columbia Basalt flows appeared at the same approximate time, causing speculation about their origin. 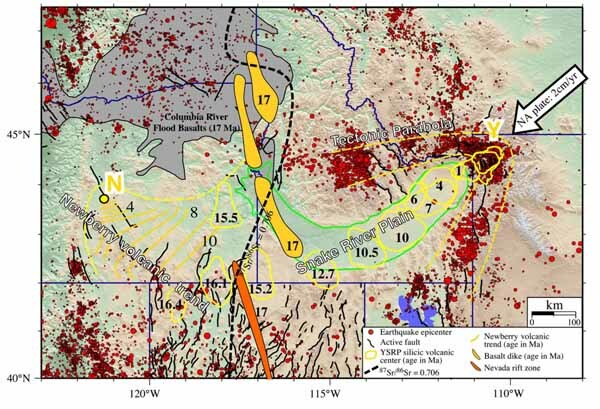 Integration of geophysical and geological data show that the Yellowstone hotspot resulted from a mantle plume interacting with the overriding North America plate, a process that has highly modified continental lithosphere by magmatic and tectonic processes and produced the 16-17 Ma, 700-km-long Yellowstone-Snake River Plain (YSRP) silicic volcanic system. Fig. 7. Path of the Yellowstone hot spot over the past 15 million years. The large arrow shows the direction of North America plate motion. The topographically low area occupied by the Snake River Plain is outlined in green. Centers of post-17 Ma silicic volcanism (in yellow) contain multiple caldera-forming eruptions. The area of Columbia River flood basalts is gray. 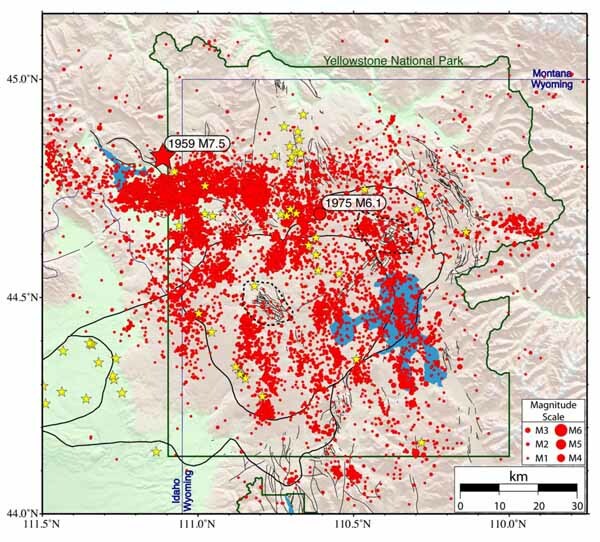 Red dots are historic earthquake epicenters taken from compilations of the University of Utah of M1.5 – 7.5 earthquakes. Black lines show late Quaternary faults; Cenozoic basaltic dikes (age in Ma) are shown in yellow and orange. 87Sr/86Sr isotope boundary for the 0.706 values is shown as a black-dashed line and is interpreted to separate continental lithosphere to the east and oceanic lithosphere to the west. The tectonic parabola is defined by the bowshaped pattern of high topography and seismicity surrounding the YSRP (yellow dashed lines). The Newberry trend of silicic volcanism extends NW across southeast Oregon to the Newberry caldera (N). Fig. 8. Seismicity of the Yellowstone Plateau (1975-2007). Seismic activity in Yellowstone National Park continues and is reported hourly by the Earthquake Hazards Program of the U.S. Geological Survey. Yellowstone experiences thousands of small earthquakes every year. There have been six earthquakes with at least magnitude 6.0 or greater in historical times, including a 7.5 magnitude quake that struck just outside the northwest boundary of the park in 1959. A 6.1 magnitude earthquake struck inside the park on June 30, 1975. For three months in 1985, 3,000 minor earthquakes were detected in the northwestern section of the park, during what has been referred to as an earthquake swarm, and has been attributed to minor subsidence of the Yellowstone caldera. 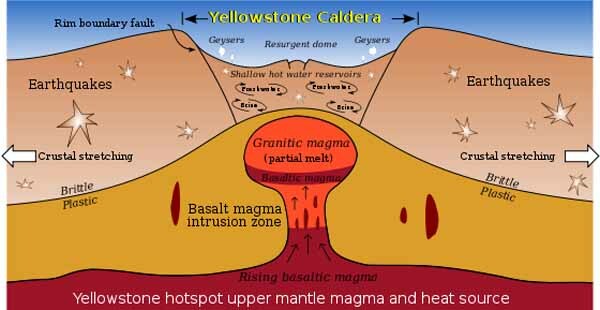 Beginning on April 30, 2007, sixteen small earthquakes with magnitudes up to 2.7 occurred in the Yellowstone Caldera for several days. These swarms of earthquakes are common, and there have been 70 such swarms between 1983 and 2008. In December 2008, over 250 earthquakes were measured over a four day span under Yellowstone Lake, the largest measuring a magnitude of 3.9. In January 2010, more than 250 earthquakes were detected over a two day period. Fig. 9. 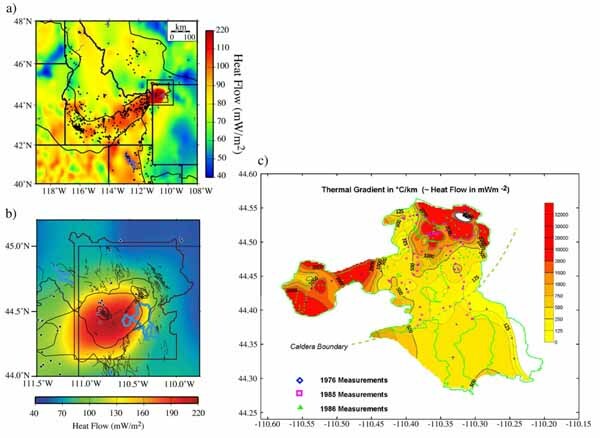 Maximum focal depths of the Hebgen Lake-Yellowstone area serve as a proxy for temperature at the brittle-ductile transition: (a) well-located hypocenters (red dots) along 10-km-wide windows corresponding to profiles in map view (b). The 80th percentile maximum focal depth is marked by the dashed line. This depth is interpreted at ~400 °C. (b) Contoured map of the 80th percentile focal depths showing the very shallow focal depths in the caldera produced by high temperatures. Yellowstone was the first continental hotspot to receive a dedicated field experiment. The tomographic inversion reveals slow P-wave velocities beneath the Caldera, down to the base of the model at a depth of 100 km. The anomaly reaches 15% and is about 50 km in diameter. The survey was extended to the southwest (across the Snake River Plain). The results indicate 2% slow material down to the base of the model at 350 km depth. The authors emphasize that they do not find evidence for a wide cushion of slow material ponding beneath the lithosphere, but rather a thin conduit of low velocities extending down to at least 300 km. Fig. 10. 1. High topography (green) correlates with local seismicity (black dots) and defines hotspot swell. (4) mantle beneath SRP is anomalously hot beneath SRP at 660 km, but appears to be cool at 410 km. Fig. 11. 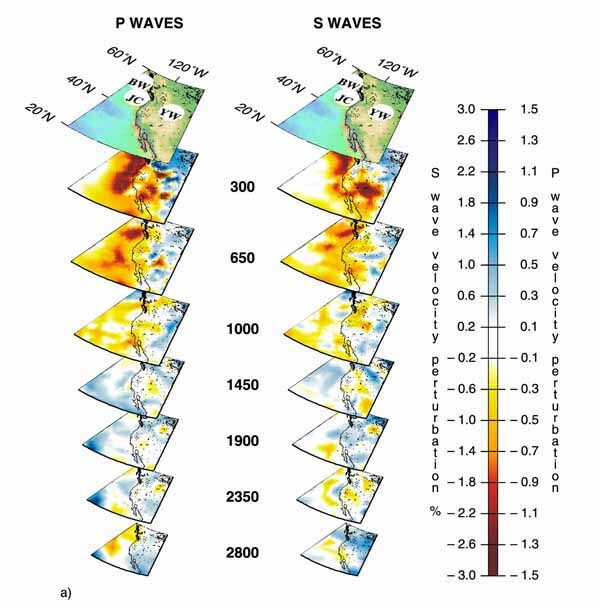 (a) Three-dimensional view of the plumes beneath BW (Bowie), JC (Juan de Fuca), YW (Yellowstone) in both (left) P-wave and (right) S-wave tomographic models. Cross sections are 400 by 400 centered around the studied plume. Vertical scale has been exaggerated to avoid overlapping of the sections. (b) Same cross sections of the S-wave velocity model of Figure 11a (right) on a horizontal plane. Geologically, Yellowstone represents a typical hot spot, with a 16 million-year-old, age-progressive linear volcanic chain and a southwest-widening topographic swell [Saltzer and Humphreys, 1997; Humphreys et al., 2000; Waite et al., 2006]. It has a high 3He/4He ratio. The absence of a deep Yellowstone plume in both PRI-P05 and PRI-S05 km is therefore surprising, and we discuss the discrepancy in some detail. The upper-mantle anomaly is much lower in strength than the broad low-velocity zone that extends south of it. At 660 km only PRI-S05 shows an anomaly and nothing is visible below 1000 km depth. 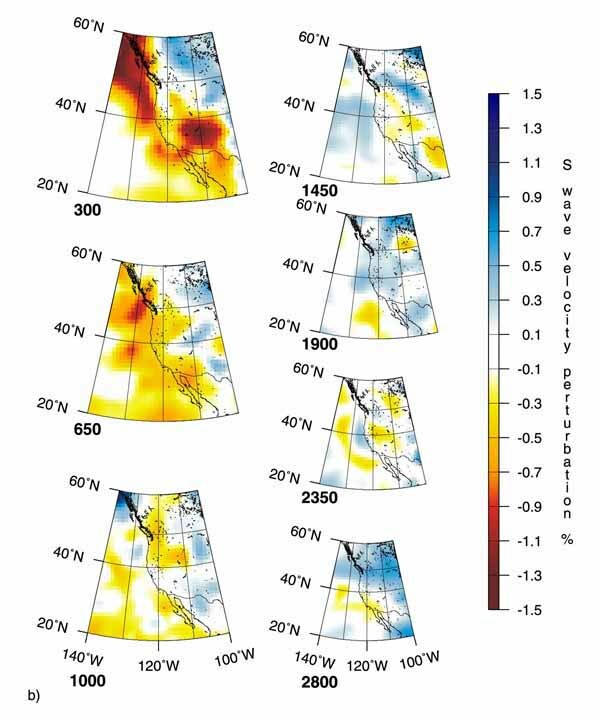 Resolution tests show that though a deep plume of 200 km radius and a velocity contrast of 0.3% should be visible but anything narrower would be invisible using our data set, and we suspect this is the main reason for the difference between global and regional inversions by Saltzer and Humphreys , Humphreys et al. , Waite , and Waite et al. . In these studies Yellowstone caps a narrow plume of about 100 km in radius, confined to the uppermost 350 km depth, which would be hard to detect in our global tomographic study.Waite et al. show the results of both a P wave and a S wave tomographic study which confirm the presence of a strong low-velocity anomaly from 50 to 200 km depth right beneath the Yellowstone caldera and eastern Snake River Plain. A weaker anomaly extends down to about 400 km, dipping about 300 west-northwest from the vertical. The low velocity body is accompanied by a fast velocity anomaly suggestive of downwelling colder, denser mantle material. They interpret the low velocity body as a plume of upwelling hot material rising from the transition zone which would promote small-scale convection in the upper 200 km of the mantle and would explain the long-lived volcanism. Fig. 12. P-wave velocity perturbation slices (% change from homogeneous background model) from tomographic inversion of teleseismic data for the Yellowstone hotspot. Data consisted of P-wave arrivals of 115 earthquakes recorded at 85 stations with 4890 P, PKIKP and PKiKP arrivals. Maps are horizontal slices of P-wave velocity in % at selected depths with corresponding relative decrease (red) and increase (blue) velocities. Contours indicate the ±0.5%, ±1.0% and ±1.5% perturbations. 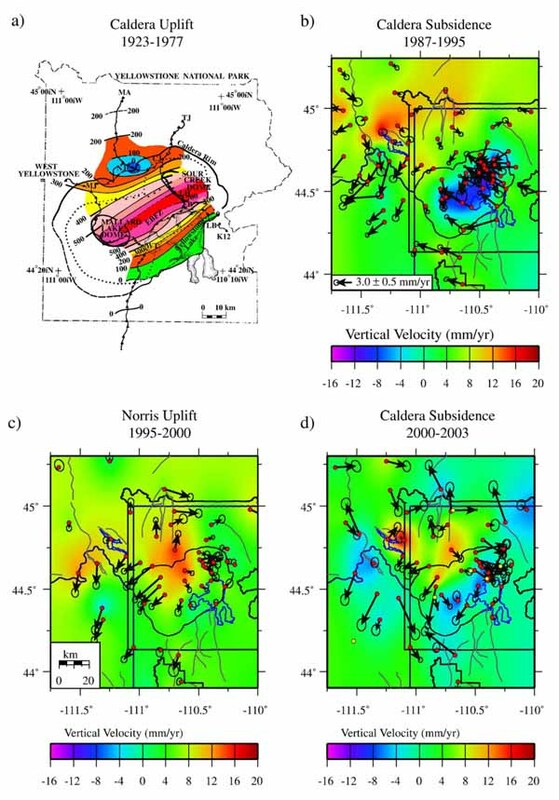 Note the low-velocity anomaly beneath Yellowstone is displaced to the west as depth increases. A high-velocity zone is located to the east of Yellowstone. Profile lines for Fig. 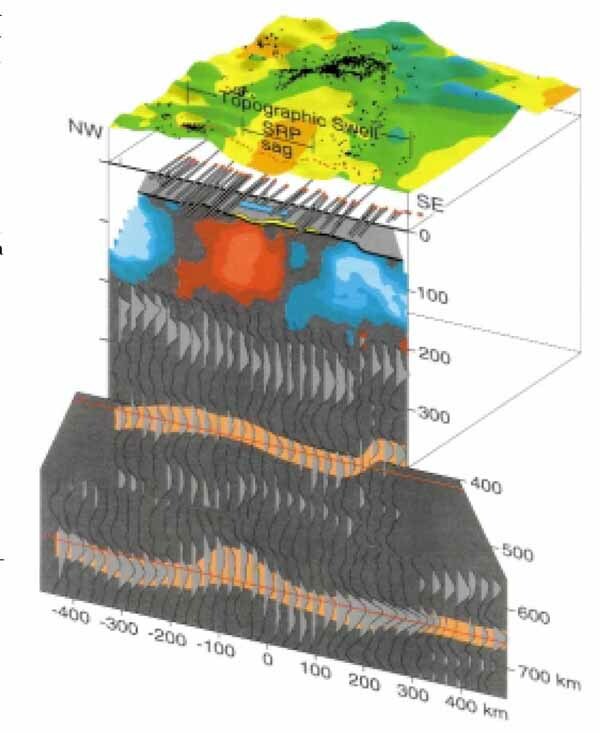 13 are shown in the 30 km and 330 km depth slices. Fig. 13. 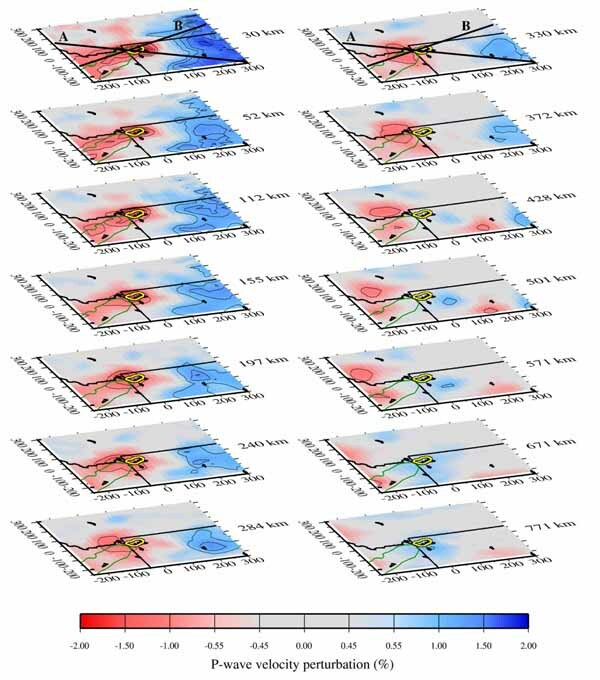 Two-dimensional cross sections of the Yellowstone P-wave low-velocity anomalies corresponding to Fig. 12. 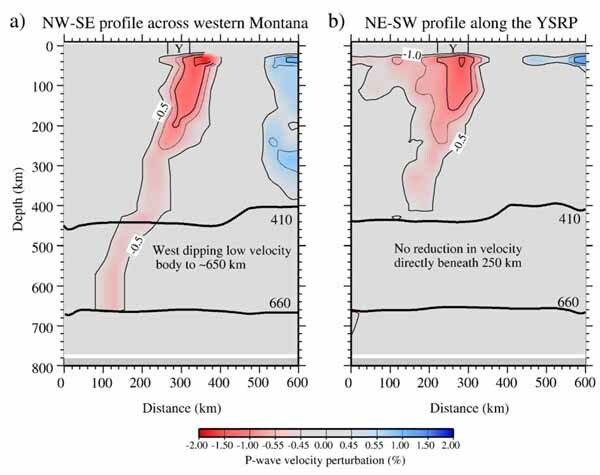 (a) NW-SE cross-section across western Montana and western Wyoming, and (b) NE-SW profile along the YSRP. Significantly these profiles reveal a 60° west-dipping low-velocity anomaly of up to -2.5%. The anomaly extends to at least 660 km in the NW-SE profile, but does not extend deeper than 200 km beneath Yellowstone in the NE-SW profile. The location of the Yellowstone Plateau is marked with a “Y”. 1. 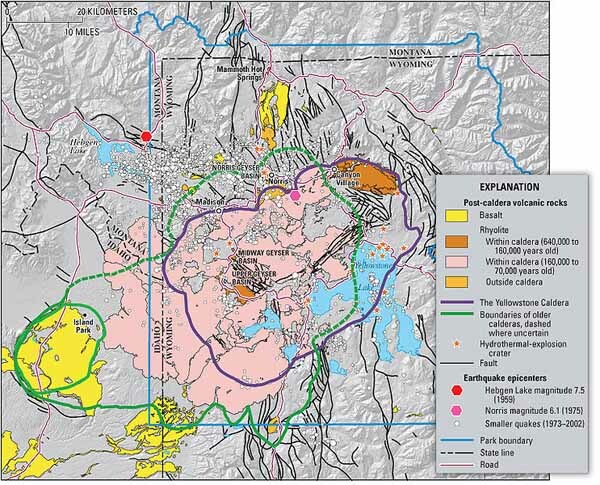 Humphreys, E.D., Dueker, K.G., Schutt, D.L., and Smith, R.B., (2000) Beneath Yellowstone: Evaluating plume and nonplume models using teleseismic images of the upper mantle: GSA Today, v. 10, no. 12, p. 1–7. 2. Montelli, R., G. Nolet, F.A. Dahlen, and G. Masters., (2006) A catalogue of deep mantle plumes: New results from finite-frequency tomography. Geochemistry, Geophysics, Geosystems 7, Q11007, doi:10.1029/2006GC001248. 3. Nataf, H.C., (2000) Seismic imaging of mantle plumes. Annual Review of Earth and Planetary Sciences 28:391–417. 4. 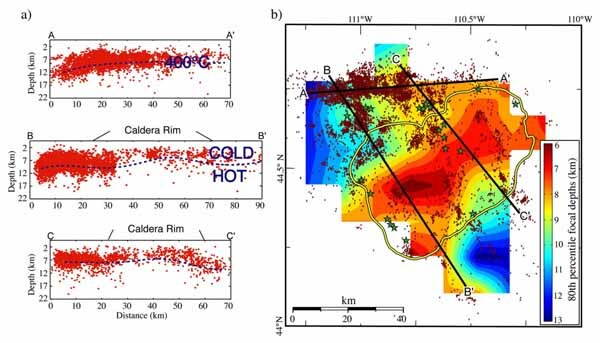 Smith, B., M. Jordan, B. Steinberger, C. Puskas, J. Farrell, G. Waite, S. Husen, R.J. O'Connell and E. Klingele , (2009) Geodynamics of the Yellowstone hotspot and mantle plume: Seismic and GPS imaging, kinematics and mantle flow, J. Volcanol. Geoth. Res., 188, 26-56.